I am thrilled to welcome Hannah Moss today with the tale of a very real Gothic heroine! In her Gothic parody Northanger Abbey (1818) Jane Austen describes the perils and pitfalls of relating horrid novels to everyday situations with all the wit and verve we know and love her for. It’s all too easy to laugh at the craze for sensationalist Gothic literature when the shock and awe plots of novels churned out by the Minerva Press can seem so unrealistic, but Catherine Morland has a rather illustrious real life forebear in the form of Caroline of Brunswick (1768-1821). The wife of George IV didn’t just read Gothic novels, she cast herself as the Gothic heroine of her own life story – and in many ways she had good reason to do so. The Hanoverians had far more family feuds, secret marriages, adulterous liaisons and illegitimate children than you’ll find in any eighteenth-century Gothic Romance. It has to be said that Caroline was a surprise choice of wife for her cousin George, Prince of Wales. She may have fulfilled the requirements of being a Protestant German princess, but she was passionate, wilful and impulsive by nature. As a teenager her parents had practically kept her under lock and key to prevent her causing a scene in public, but without the social interaction required to polish her manners she lacked refinement. 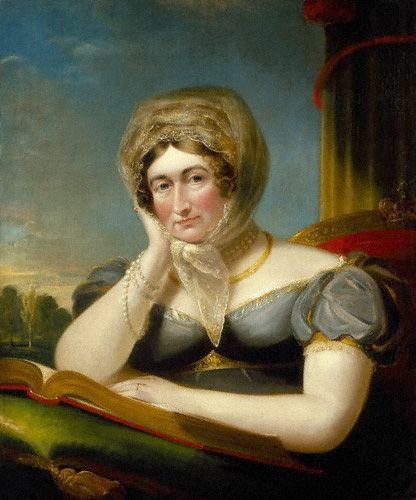 Caroline could hardly be described as an accomplished young lady; her English was bad and her letters showed a disregard for spelling and punctuation – even her personal hygiene was somewhat deficient, and it is rather telling that she remained unmarried at 27. 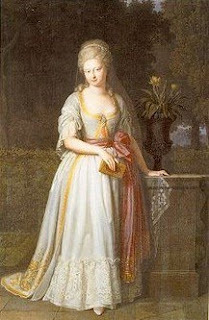 However, Countess Eleonore von Münster, who had been brought in to teach the 15 year-old Caroline in 1783, did succeed on at least one level – and that was by nurturing her young charge’s love of literature. Caroline read voraciously, consuming a diverse range of books. Her literary tastes encompassed everything from religion and history to poetry and plays, but she developed a particular fondness for Gothic novels. When Caroline arrived in England for her wedding in April 1795 the Prince barely took one glance at her before demanding a glass of brandy and leaving the room, claiming that he felt unwell. Neither of the pair made a good first impression. What’s more, the Prince was far too preoccupied with his latest mistress, the formidable Countess of Jersey (1753-1821), to be concerned with the woman he’d only considered marrying as a means of increasing his income to settle his debts. The Prince treated his mistress as a superior being, and this did not go unnoticed by his slighted wife. Caroline wrote to her mother to complain about Lady Jersey’s hold over her husband and say that she was afraid of what would happen. The Duchess of Brunswick duly passed on these fears to her brother George III, writing in October 1795: ‘I fear some black design, Lady Jersey turns every word the poor Princess says, and her whole thrust is to hurt her in your opinion.’ The Duchess went on to lament that her daughter was ‘frightened out of her senses.’ Did Caroline think her husband and his mistress were plotting against her? Was she scared of being locked away in a castle - or even framed for adultery? She certainly had the overactive imagination to believe it, fuelled by both her novel reading and real life events. Caroline had every reason to be wary after what had happened to her older sister, Augusta (1764-1788). In a story worthy of a Minerva Press novel, Augusta had married Prince Frederick of Württemberg (1754-1816) in 1780, who at 6ft 11” and weighing 200kg towered over the petite princess and was, by her account, a violent and profligate husband. In 1786 - after having four children together - he cruelly abandoned his wife, blaming her licentious behaviour. However, Augusta’s version of events was that her scheming husband had actually arranged for a man to be caught in her room, but fearing such a plot she had insisted that her maid stayed with her at all times to prove her innocence. Augusta turned to the Russian royal court for sanctuary, but she later fell from Catherine the Great’s favour and was imprisoned for we know not what crime. Then in 1788 the family were suddenly informed of Augusta’s death. Precise details were not forthcoming and the body was never sent to Brunswick, giving rise to fanciful stories that Augusta had in fact escaped. No-one relished the possibility more than Caroline who delighted in recounting the various supposed sightings that were made across Europe, including an appearance in a box at the Genoa opera. The sad truth was that Augusta had actually died in childbirth. She had begun a relationship with Wilhelm von Pohlmann whilst in his custody at Lohde castle and had gone into premature labour with his illegitimate child. Not wanting to reveal their secret by seeking medical assistance, the baby was stillborn and Augusta died of blood loss. Caroline’s literary diet of Gothic novels had taught her to hope that escape was possible, but also alerted her to the dangers a similarly unhappy marriage could present. 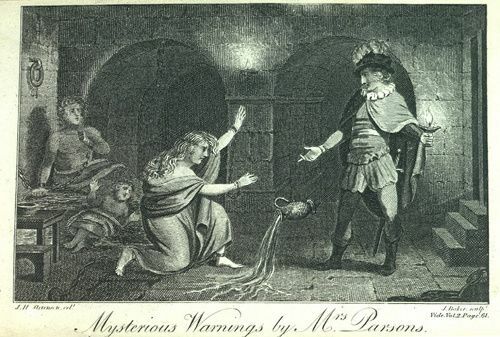 The Prince and Princess of Wales had been married for a year and had a baby daughter by the time Eliza Parsons dedicated her 1796 novel The Mysterious Warning to Caroline – praising ‘the dignified features’ of the Princess’s character, which have insured ‘the affections of a grateful and admiring people’. The text is one of the seven ‘horrid novels’ which Isabella Thorpe recommends to Catherine Morland in Northanger Abbey, and Parsons’ overriding message is one of filial obedience; marriage after marriage fails when entered into without parental consent. Given that the Prince had contravened the Royal Marriages Act (1772) by marrying the Roman Catholic widow, Maria Fitzherbert in secret makes the subject matter particularly relevant. Satirical prints, including Gillray’s ‘The Morning after Marriage’ (1788), had responded to the rumours that an illegal ceremony had taken place in 1785, but Parsons was more likely to have been interested in securing a fashionable patroness than in commenting on the unstable foundations of the Wales’ marriage in dedicating this work to her. Never the less, it is an interesting reminder of how life can imitate art, and vice versa. The plot twists of early Gothic novels definitely don’t seem quite so improbable when compared to the stories of family feuds, female incarceration, adultery and insanity amongst the Hanoverians! Detested by her own husband and with a limited circle of females of her own rank permitted to see her, Caroline disappeared from view – her conspicuous absence from society duly noted by Lady Palmerston, who described her as ‘our poor captive princess.’ Holed up in Carlton House, Caroline sought solace in reading and would initiate long conversations about literature with the sub-governess Miss Ann Hayman, who was employed to care for Princess Charlotte in 1797. In her letters Miss Hayman records how Caroline was full of praise for Regina Maria Roche’s The Children of the Abbey (1796), which she insisted on lending to her. Caroline may have been guilty of casting herself in the role of persecuted Gothic heroine, but her enthusiasm for such books also helped her to communicate with other women and a create a network of readers from a position of isolation. After all, part of the excitement of reading Gothic novels is undoubtedly sharing what you have read with others. Hannah Moss is a postgraduate student at the University of Sheffield with a research interest in eighteenth-century Gothic novels. In her spare time she is busy writing a biography of Lady Jersey. Written content of this post copyright © Hannah Moss, 2016. You can find out more about Caroline's scandalous life and disastrous marriage in Life in the Georgian Court, now available to order worldwide! I read that Caroline's sister was imprisoned in one of Catherine's fortresses and died there of starvation. She had fallen for one of Catherine's own lovers. The body was found later. Also, Caroline's mother and father were said to live in different houses within an estate with the Duke living with his French mistress . Caroline visited there. No one took time with the girl. One story about why the Prince married Caroline is that he had the choice between the King's niece or the Queen's niece. Frances Lady Jersey, his mistress at the time, helped him choose the king's niece. The Prince and his mistress knew that the Queen wouldn't stand for the slight to her niece of his having a mistress around while the king believed more in hands off another's marriage. Any way it was Lady Jersey who met Caroline when she disembarked and traveled with her to meet the Prince and went along on their honeymoon with them. Caroline never had a chance. Yes, it seems to have been a bit of a mystery until some years later when Augusta's eldest son had her death investigated. As for the Duke of Brunswick's mistresses, they are also rather interesting figures. Maria Antonia Branconi was the official mistress from 1766 until 1777, when she was replaced by Luise Hertefeld. Both women were renowned for their beauty and intellect, but their presence undoubtedly put a strain on family life. According to Caroline her mother 'could not suffer the attachment' between the Duke and Luise. The Duchess, therefore, retired from court and found solace in religion, but remained worried that her husband was setting an immoral example to their children. In later life Caroline recalled how she felt like a 'shuttlecock' between her parents - if she showed any regard for one, the other would scold her for it. It's no surprise then that Caroline should have been so anxious when faced with her own husband's mistress. I find the strained relationship between Lady Jersey and Caroline fascinating!